According to folklore about early Indiana, a squirrel could have jumped from Ohio all the way to Illinois - that is, the critter could have crossed the width of the Hoosier state - without touching ground. That's an indication about the density of the woodland forest here 300 years ago, before the massive clear-cutting of trees by settlers that made the Indiana landscape almost resemble a prairie. To explore our tree canopy, as well as an array of other aspects related to our towering friends, Nelson will be joined in studio by David Forsell, president of Keep Indianapolis Beautiful, Inc., known as KIB. David and his volunteer-based organization have been reaping attention for endeavors that included partnering with Eli Lilly and Co. for an employee service day earlier this month that involved planting more than 3,000 trees across the Hoosier capital. Expect David and Nelson to share details about the city's oldest tree, a bur oak in Irvington estimated to be about 400 years old. According to Steve Barnett of the Irvington Historical Society (who, by the way, was a studio guest last month for a Hoosier History Live! 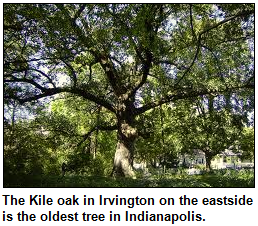 show about his neighborhood), the tree, known as the "Kile Oak," also is one of the largest bur oaks in the state. During our show, David Forsell promises to identify the tree in Indy that he considers, as he puts it, "the most beautiful tree I've ever seen." 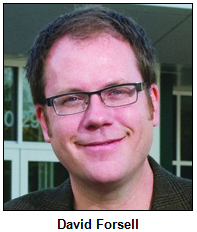 His organization, headquartered in a renovated abandoned warehouse in Indy's Fountain Square neighborhood, has planted hundreds of trees in that neighborhood alone by partnering with Friends of Fountain Square, the North Square Neighborhood Association and other community groups, according to the Urban Times monthly newspaper. 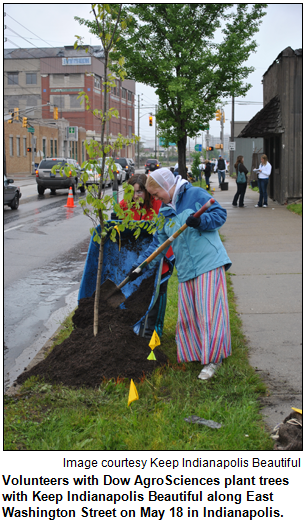 Click here for an application form to receive free trees from the organization. Urban Times notes that KIB (which has a goal of eventually planting 100,000 trees in Indy) developed a map to identify areas in the city where trees would provide the most benefit in terms of "environmental and socio-economic factors." In addition to volunteers who water and mulch the newly planted trees, KIB employs high school students and other young people to care for those trees that "need sustenance through other means." According to the book 101 Trees of Indiana (Indiana University Press) by Marion T. Jackson, in the "pre-settlement" era, the state was dominated by forests that consisted of American beech and sugar maple trees (50 percent); various species of oak and hickory (30 percent) and a mixed forest "of Appalachian origin" (more than 7 percent). 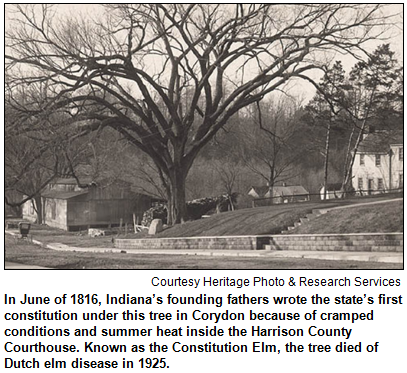 David and Nelson also expect to share insights about Indiana's official state tree. It's the tulip tree, sometimes called the yellow poplar. 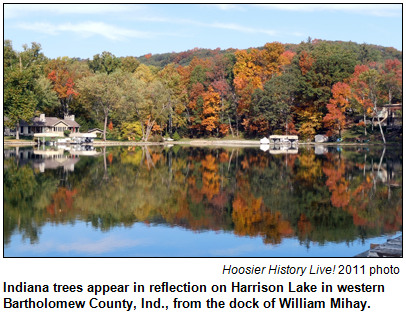 "No tree species could be more appropriate as Indiana's state tree," according to 101 Trees of Indiana. "Native to nearly all areas of the state, ancient in lineage, majestic in form, impressive in dimensions, beautiful in all seasons, it truly graces the Indiana landscape, either as a forest monarch or as a handsome ornamental." The book notes that the tulip tree once was the prime timber for log cabins in Indiana. It's also been widely used for furniture and cabinetry. David's wife is Shannon Forsell, an acclaimed singer who is managing director of the Cabaret at the Columbia Club. They live in the Watson-McCord neighborhood near 38th Street and College Avenue. Built in 1926, the Forsell's Tudor Revival-style bungalow was recently featured in the Indianapolis Business Journal and other publications. Their home is surrounded by - no surprise - tall, shady trees. Among Indiana trees known for fall coloration, the sugar maple wins much praise. Its dense crowns are known for turning brilliant shades of orange and red. 101 Trees of Indiana features an observation from literary great Willa Cather: "Today I stood taller from walking among the trees." 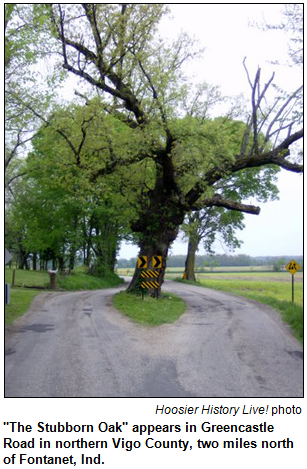 In keeping with our "Trees, trees, and trees" topic, Chris Gahl of the ICVA suggests we take a Roadtrip to see the "Stubborn Oak" in Nevins Township in northern Vigo County that has been saved by countless generations of "tree huggers" long before there was such a term. Legend has it that a lone farmer stood decades ago with a shotgun to protect the tree from "the men from the county" who sought to remove the tree with a cross-cut saw. The oak had been on his farm for decades, and he objected to it being cut down for the sake of "progress." Somewhat like the true origin of the word "Hoosier," the actual story may be lost to time, but the tree does remain triumphant. When in the area, you also can check out the Thorpe Ford Covered Bridge near Rosedale in southern Parke County. Alas, you can't see nearby Jeffries Ford Bridge because it was destroyed by arson in 2002. The fruit from this type of tree is often called the "Indiana banana." This tree is on the small side, but it has extremely large leaves with smooth edges. The tree grows throughout Indiana, particularly along streams and in woods and thickets with rich, moist soils. In fact, it often grows in colonies that are referred to as "patches. Question: What is the tree? To win the prize, you must call in with the correct answer during the live show. Please do not call if you have won a prize from any WICR show during the last two months. The call-in number is (317) 788-3314, and please do not call until you hear Nelson pose the question on the air. The prize is a an overnight stay at Hilton Indianapolis North and a pair of tickets to Conner Prairie, courtesy of the ICVA. Please tell our sponsors that you appreciate their support: Aesop's Tables, Broad Ripple Brewpub, Indiana Historical Society, Lucas Oil, Sexton Companies and Story Inn. Acknowledgments to Print Resources, Indianapolis Marion County Public Library, Monomedia, Indiana Humanities, Indianapolis Convention & Visitors Association, WICR-FM, Fraizer Designs, Heritage Photo and Research Services, Derrick Lowhorn, Samantha Stratton and many other individuals and organizations. We are an independently produced program and are self-supporting through organizational sponsorships, grants and through individual tax-deductible contributions through the Indiana Humanities Council. Visit our website to learn how you can support us financially. 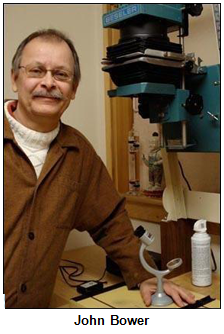 John Bower is an award-winning, Bloomington-based photographer with a rare distinction. 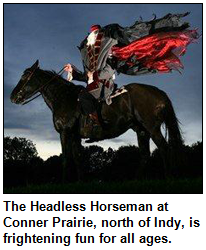 He has visited, as he puts it, "every city and town on the map of Indiana." As a result, John has a silo-high stack of anecdotes and stories about towns he never had heard of until he visited, such as Merom, where he says there's "an amazing spiral staircase in an attic" and West Terre Haute, where he discovered an abandoned brick and tile factory. During one of John's trips to Alexandria, he photographed a factory where rock wool, a precursor of fiberglass, was invented and manufactured. "While our society values the newest, the costliest and the flashiest, I'm motivated to rediscover that which has been ignored, forgotten, or cast aside," John says. "By using the inherent drama of black-and-white photography, I'm able to capture the essence - the elan vital - of these subjects." John, who owns Studio Indiana with his artist wife Lynn, estimates he has traveled 90,000 miles to visit every city and town (a total of 2,099 localities) on the Indiana highway map. 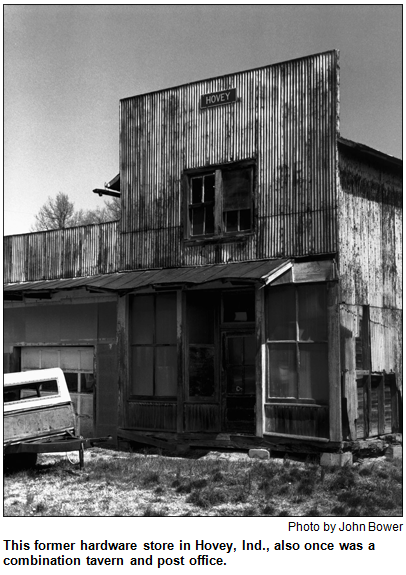 Lingering Spirit (2003), which he calls "a tribute to Indiana's fading, forgotten and forlorn places." After the Harvest (2007), which features images of Indiana's historic grain elevators and feed mills. The Common Good (2010), which includes photos in Gary of the former main post office, a once-grand, now-abandoned art deco structure built in the 1930s. John and Lynn, who writes most of the text for the books, met as teachers more than 35 years ago in Kendallville. After school, they would climb into the car and take off down a route they'd never traveled before.